CMHS President & CEO Gary K. Wilde has been given the keys to the new Community Memorial Hospital in Ventura. Community Memorial Health System (CMHS) moved a significant step closer to opening the new Community Memorial Hospital (CMH) when CEO Gary K. Wilde received the keys to the now complete 250 room Ocean Tower located on Brent Street in Ventura. The six-story Ocean Tower is adjacent to the current/old hospital, which is now known as the CMH Mountain Tower. Now that CMHS has taken official possession of the newly constructed facility, the move-in process will begin. It’s anticipated that the new hospital will open to patients and the public in about four months. During the next four months, CMHS will install the final pieces of technology and equipment, provide safety training and new process and procedure training to all staff, train physicians on the facility’s new features, stock the building with supplies, and install over 500 pieces of original artwork from local artists. 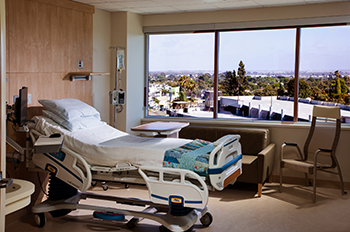 The new Ocean Tower features 250 all private patient rooms. 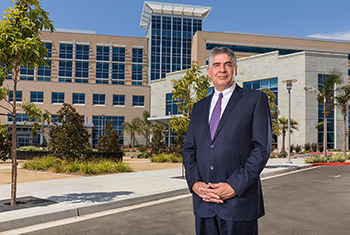 With overwhelming community support and a capital campaign that successfully raised over $25 million, CMHS built the new Ocean Tower to meet seismic requirements that the state of California mandated after the 1994 Northridge earthquake, to replace an aging structure built in the 1960s, and to attract the next generation of physicians. The new CMH will better meet today’s needs and expectations for high-quality care and enhanced patient privacy. 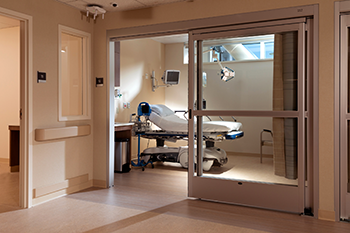 The Ocean Tower Emergency Department offers 37 private rooms, as compared to 17 curtained bays in the existing hospital. The new Ocean Tower fully complies with state seismic codes and will be able to provide critical medical services to the community during emergencies or disasters. To ensure the building is secure and does not move from its foundation during a major earthquake, steel anchors were embedded into a newly created concrete bedrock foundation underground, then encased in a concrete structure and secured to the new hospital, anchoring it to the bedrock. Features of the Ocean Tower include 250 all private rooms and expanded space in all critical healthcare areas such as the Neonatal Intensive Care Unit and the Intensive Care/Coronary Care Unit. The Emergency Department has also been significantly expanded and will offer 37 private rooms, compared to 17 curtained bays in the current hospital. The surgical capacity also increases as the new facility will feature 10 operating suites as well as 5 new heart catheterization laboratories, and an entire floor will be dedicated to the care and well-being of moms, babies, and children. 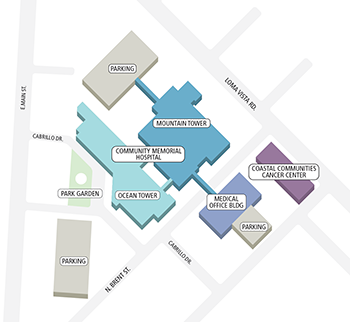 The expanded CMHS campus includes the new Ocean Tower, the Mountain Tower, Medical Office Building, Coastal Communities Cancer Center, and two parking structures. The new 8-acre campus is now comprised of the Ocean Tower (inpatient services), Mountain Tower (outpatient services), the medical office building and same-day surgery facility, the Coastal Communities Cancer Center, a new community park and labyrinth, a Healing Garden for patients and their families, and a Respite Garden for staff and visitors. Other new features include an outdoor dining terrace and additional parking in a newly constructed parking structure for the hospital and the public. Subscribe to the CMHS NewsBites Blog and like us on Facebook for exclusive behind the scenes footage of our move into the new hospital as well as detailed sneak peeks of some of the building’s most important new features!